It is aptly said that the quench to do something different drives the creation of trends for many to follow. The seeds to set one such trend in SP Jain, Dubai campus were sown in March 2016. What followed were a couple of meetings and endless efforts of the Corporate Relations Team and the students of Jan 2016 intake to materialise the first ever Inter-Corporate Table Tennis Tournament in SP Jain. The morning of 15th April, 2016 witnessed some heated table tennis matches in the premises of SP Jain by the gurus of the corporate world. 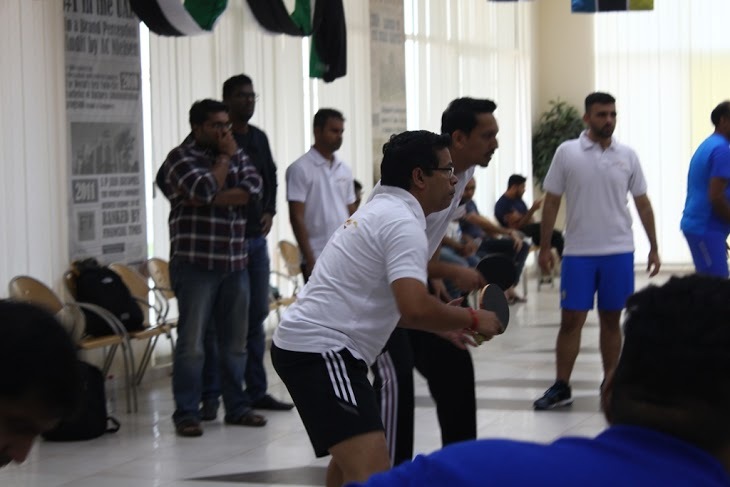 Teams from Dubai’s leading corporates like Agility Logistics, African + Eastern, Stanley Black & Decker, Danzas DHL, Al Tayer Group, Dunia Finance, Grenke, Network International, Aditya Birla Group and Emirates Money among others participated in the tournament. An enthusiastic students’ team from SP Jain also joined these teams.